Today is the Appearance day of the Avatar Nrsimhadeva. Also known as Narsingha, He is the Half lion, half man incarnation and is none different to Lord Krishna. Nara = Half, Singh = Lion. To his enemies he is terrifying and ferocious but to his devotees he is their merciful protector, remover of obstacles and destroyer of unwanted tendencies in their path of bhakti or devotion. Lord Nrsimhadeva delivers his devotee Prahlad Maharaj and annihilates the miscreant demon King Hiranyakashipu in order to re-establish religiosity, as well as display his divine Lila (story) for the benefit of generations to come. What we learn from this divine Lila is that Lord Krishna is present everywhere and will always protect his sincere devotee. In the Bhagavata Puran Krishnas previous incarnation was Varaha Dev, the boar incarnation. In this lila Varaha Dev killed the evil demon Hiranyaksha, the brother of Hiranyakashipu. Hiranyakashipu wanted revenge for the killing of his brother and so performed severe austerities and penance in order to gain the power to defeat Lord Vishnu (Krishna). His severe austerity caused great distress and fear throughout the universe and so Lord Brahma appeared before him to offer the demon a boon in order to stop the distress his yogic austerities were causing. Hiranyakashipu asked for the benediction that he become immortal however Lord Brahma, the creator of the material world stated that one day even He will die and therefore immortality is a benediction that he cannot give. Therefore, the cunning Hiranyakashipu tried to cheat his way to immortality and asked for the following. By any human being or animal. Any entity, living or non-living. Any great snake from the lower planets. 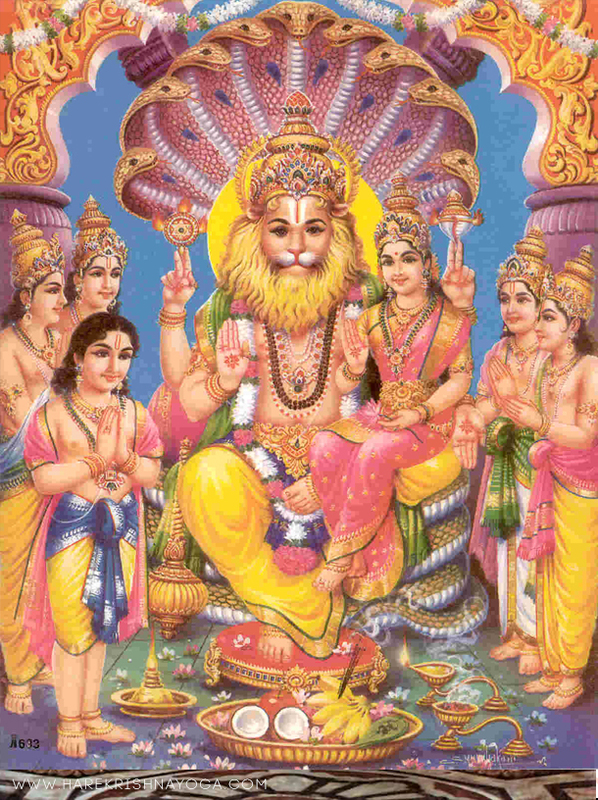 Lord Brahma granted these boons and Hiranyakashipu became a tyrant ruler. Shortly after he banned the worship of Lord Vishnu and declared that everyone worship him instead. However his own son, Prahlad did not accept this. When in his mothers womb his mother received divine instruction from the great sage, Narad Muni. He taught her and her unborn child the glories of Lord Vishnu and devotional service. This transcendental knowledge was heard by Prahlad even before birth and so he was born a pious devotee of Lord Vishnu. From a young age Prahlad was praying to Lord Vishnu and preaching to others about Lord Vishnu. This infuriated Hiranyakashipu and he ordered his servants to kill his young son. His servants tried many different ways to kill Prahlad, however every time Prahlad was in danger he would meditate and chant the names of Vishnu and Vishnu would protect him. He would escape unharmed from whippings, from fire and even from being thrown from a cliff and being trapped with a mad elephant! Eventually Hiranyakashipu decided to end Prahlad's life himself. Hiranyakashipu picked up his sword and threatened his son. He exclaimed "Where is your God now? Show me him!" Bhakta Prahlad humbly replied "Lord Vishnu is everywhere." The angry demon replied, "But where is He? If He is everywhere, then why is He not present before me in this pillar?" Hiranyakashipu in frustration and anger struck his fist against the pillar in question and with a mighty thudding crack Lord Narasimhadeva emerged from the pillar. With a tumultuous roar and in crouching position ready to pounce on his opponent, Hiranyakashipu's end was near. The beautiful, angry form of Lord Vishnu with a Lion for head battled with the demon. Hiranyakashipu was no match for Lord Narasimhadeva and the Lord killed the demon as if crushing a wasp between one's fingernails. The method and timing of killing the demon Hiranyakashipu was very strategic. Lord Nrsimhadeva was Vishnu himself and therefore not a living entity created by Lord Brahma. Lord Nrsimhadeva was standing in a door way therefore he was neither Inside or outside. The time of day was twilight and was neither during the daytime or at night time. Lord Nrsimhadeva placed Hiranyakashipu on his lap, neither on the ground or in the sky. The mighty half Lion, half man, used his bare hands and sharp nails to rip the demon apart, without the use of weapons. Lord Nrsimhadeva was neither animal or human, but a hybrid. Lord Nrsimhadeva was an avatar of Lord Vishnu himself, descending from the spiritual realm and not classed as a living or non-living entity, demigod, demon or snake but the supreme Lord Himself. 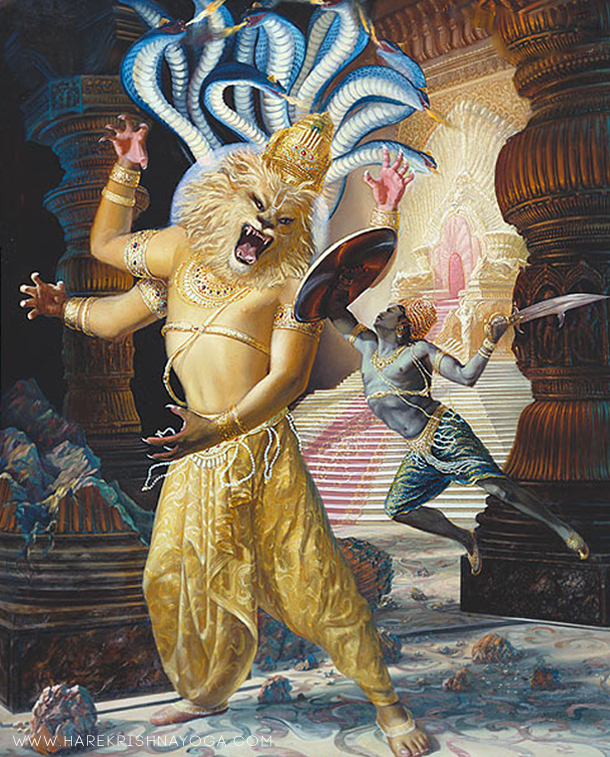 After the demon was annihilate, Lord Nrsimhadeva was still raging with fury as much as any parent would be if their child was mistreated or in danger. The demi gods and even Lakshmi Devi, the consort of Lord Nrsimhadeva did not dare to approach Him in his angry form. Only Prahlad, the young boy was brave enough to approach and garland His Lord and savior with flowers and offer his prayers which greatly pacified Lord Nrsimhadeva. Prahlad was then given charge over his father's Kingdom.